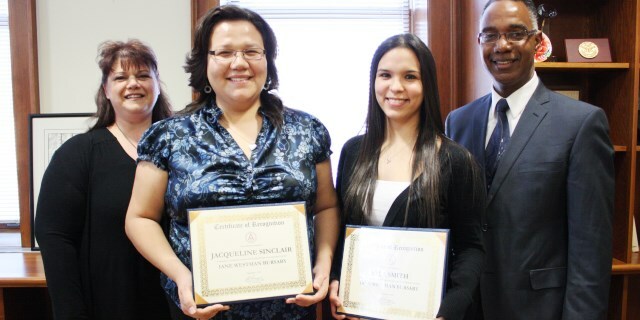 BRANDON, MB – Two Brandon University (BU) students are the first recipients of a new bursary to be awarded each year to post-secondary students of Aboriginal descent. 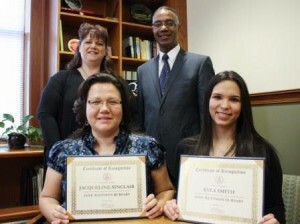 Kyla Smith, a second year Native Studies student, and Jacqueline Sinclair, in her final year of a Creative Arts degree, were presented with the Inter-provincial Association of Native Employment (IANE) Westman Bursary. IANE is a volunteer organization with chapters in Manitoba, Saskatchewan, Ontario and Alberta, promoting the employment of Aboriginal people. BU is a member of IANE, Westman. Brandon University, founded in 1899, promotes excellence in teaching, research, and scholarship; educating students so that they can make a meaningful difference as engaged citizens and leaders. Each year, BU awards more than $1.2-million in bursaries and scholarships to students.